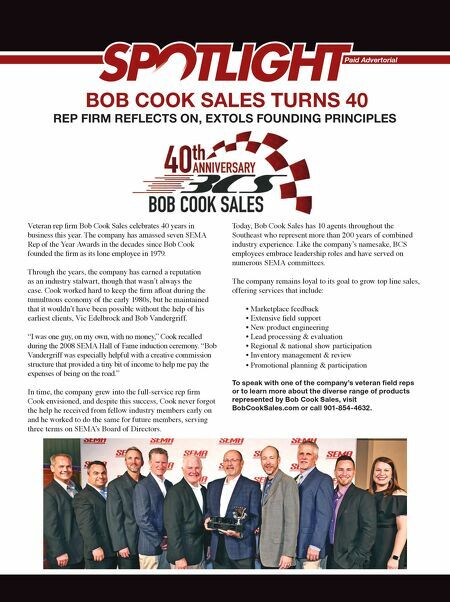 REP FIRM REFLECTS ON, EXTOLS FOUNDING PRINCIPLES Paid Advertorial BOB COOK SALES TURNS 40 Veteran rep firm Bob Cook Sales celebrates 40 years in business this year. The company has amassed seven SEMA Rep of the Year Awards in the decades since Bob Cook founded the firm as its lone employee in 1979. 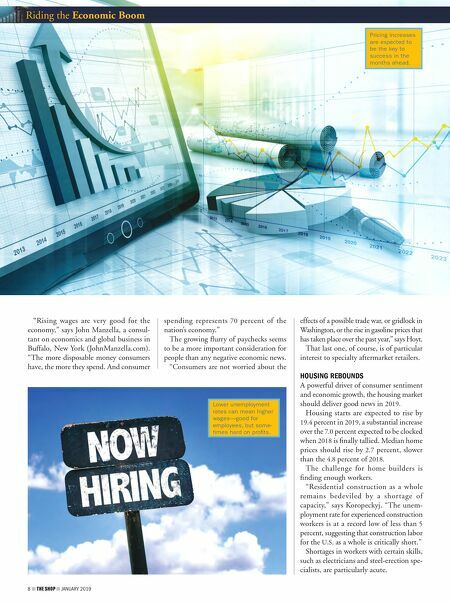 Through the years, the company has earned a reputation as an industry stalwart, though that wasn't always the case. Cook worked hard to keep the firm afloat during the tumultuous economy of the early 1980s, but he maintained that it wouldn't have been possible without the help of his earliest clients, Vic Edelbrock and Bob Vandergriff. "I was one guy, on my own, with no money," Cook recalled during the 2008 SEMA Hall of Fame induction ceremony. "Bob Vandergriff was especially helpful with a creative commission structure that provided a tiny bit of income to help me pay the expenses of being on the road." In time, the company grew into the full-service rep firm Cook envisioned, and despite this success, Cook never forgot the help he received from fellow industry members early on and he worked to do the same for future members, serving three terms on SEMA's Board of Directors. Today, Bob Cook Sales has 10 agents throughout the Southeast who represent more than 200 years of combined industry experience. Like the company's namesake, BCS employees embrace leadership roles and have served on numerous SEMA committees. The company remains loyal to its goal to grow top line sales, offering services that include: • Marketplace feedback • Extensive field support • New product engineering • Lead processing & evaluation • Regional & national show participation • Inventory management & review • Promotional planning & participation To speak with one of the company's veteran field reps or to learn more about the diverse range of products represented by Bob Cook Sales, visit BobCookSales.com or call 901-854-4632.